1. Whisk together olive oil, maple, soy sauce, garlic, apple juice and black pepper. 2. 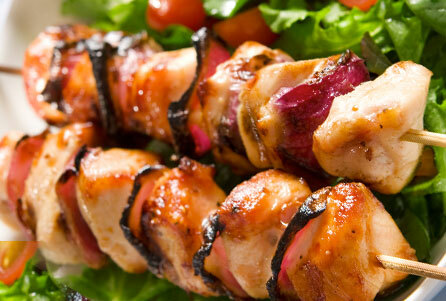 Pour into large zip-lock bag, save a small amount of marinade to brush onto kabobs while cooking. 3. Add chicken to marinade. 4. Preheat the grill for high heat. (Or, broil is fine). 5. Alternate chicken, onion and peppers on skewers. Sprinkle with Maui Onion Seasoning. 6. Place the skewers on the grill. 7. Cook for 12 to 15 minutes total, turning every 4 to 5 minutes. 8. Brush remaining marinade onto skewers.